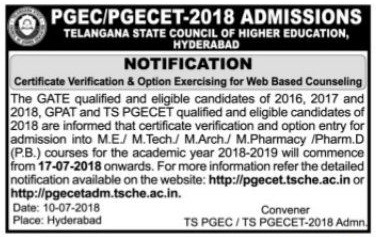 TS PGECET Counselling Dates 2018 Rank Wise, Certificate verification, Web Options details are available at pgecetadm.tsche.ac.in. The GATE qualified and eligible candidates of 2016, 2017 and 2018, GPAT and TS PGECET qualified end eligible candidates of 2018 are informed that certificate verification and option entry for admission into M.E/M.Tech/ M.Arch/ M.Pharmacy/Pharm.D (P.B) courses for the academic year 2018-2019 will commence from 17-07-2018. For more information refer the detailed notification available on the website: pgecet.tsche.ac.in or pgecetadm.tsche.ac.in. This notification itself is a call for web counseling. No separate call letters are sent to the individual candidates. Mere attending of the web counseling does not guarantee a seat. Candidates have to pay non-refundable processing fee of Rs.600/- for SC/ST candidates and Rs.1200/- for others at the time of certificate verification. Candidates claiming NCC/CAP/SPORTS/PH (Special Categories) have to attend for certificate verification at A.V. College of Arts, Science & Commerce, Gaganmahal, Hyderabad, Telangana. Helpline center only as per the schedule. However, they shall exercise web options on the dates mentioned above against their rank. Serving persons have to produce Service Certificate from the place of Work indicating the relationship with the Candidate. Candidates whose parents are domiciled in the State of Telangana based on the Permanent Address / Home Town declared by them while joining the service and as recorded in their Service Register are alone eligible to be considered under “CAP” Category”. NCC & Sports: Candidates have to produce Original Certificates issued by the concerned Competent Authority. GATE Score / GPAT /PGECET Rank Card & also PGECET Hall Ticket. Residence certificate for preceding 7 years of the qualifying examination i.e. Graduation in respect of candidates who have private study without any institutionalized education. Residence certificate from M. R. O of either of parents in Telangana for 10 years in case of non-local candidates. Income Certificate issued after 01.01.2018. Do we have 3rd counseling for pgcet? When is 2nd counciling sir/madam..
Sir I missed the 1st counciling plus tell me about 2nd counciling dates..
2nd counselling when? sir please tell me. Residence certificate complusury r not? Sir i got 487 rank in pg cet for msc physics….so plz inform counciling date …. Is there any other option next?? I did not get my certificates from college due to scholarship issues. What shud i submit? sir, my pgrcet rank is 1386 so pls tell me where is my verification center…..